turmeric | make a wish! I have to admit I wasn’t very familiar with asparagus, until my taste buds got to taste some very well prepared bits of this rather luxurious vegetable. I was pretty fascinated not only about the taste, but also the texture and colour. 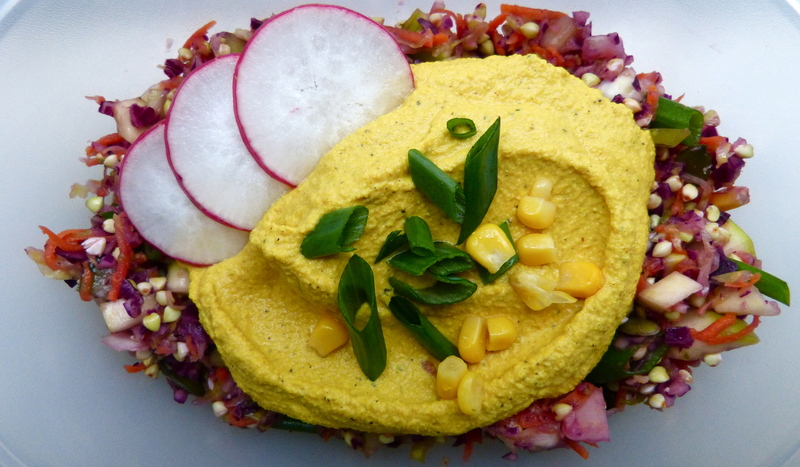 When I use turmeric, I feel that my dishes are not only vibrantly golden, but also nutritiously stronger. No wonder it has more health uses than any other medicinal herb! Over time, I learned to keep it handy and add it to almost any food being cooked over the fire or to sometimes use it for creating the loveliest salad dressings. Most often, I let myself drawn by imagining how other vivid colors would look like next to the shining yellow and this is exactly how new taste combinations and dishes turn into reality. See that mustard is in itself pretty sour, so if you choose it, you won’t need to add vinegar or too much lemon. Similarly when using soya sauce be mindful regarding how much salt you add. I like the combination between this sauce and the sweetness of chickpeas or the glutinosity of rice. 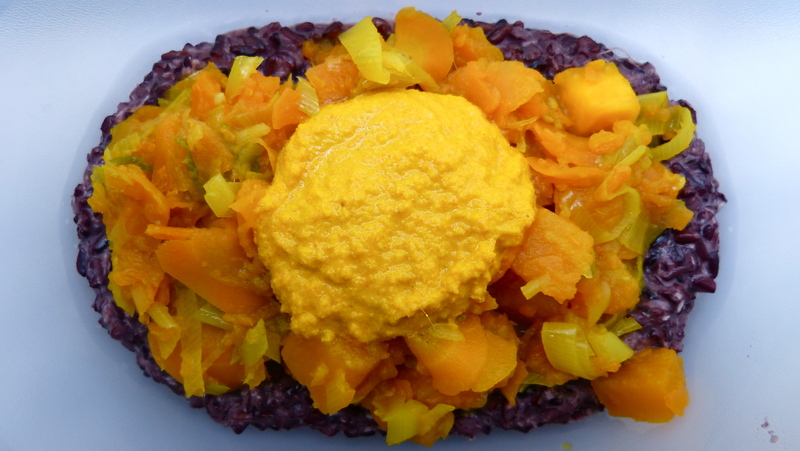 So here you have it next to a beautiful dark rice soaked in coconut milk and accompanied by autumn veggies – carrot, pumpkin, leek and sweet potatoes, them too sauteed with the magic yellow powder. Introducing: favorite Indian dish cooked on European land! Because we cannot compare the flavors and the vibe of the food when here or there…each one is quite unique! Nevertheless, I have to admit that the preparation of this one here turned out pretty authentic. Had I grated a real coconut, it would’ve been so much more Indian! But sometimes I get lazy when it comes to break open hard shells 🙂 So because the grated coconut I bought was an average one, I decided to mix it with a good coconut milk. That should work! I won’t go through all the steps myself, as you already have it crystal clear in the recipe above. My only piece of advice is not to get stuck if one spice or another doesn’t come handy, just use the most common ones. What really makes the difference here is making your own masala, grinding and roasting it properly. 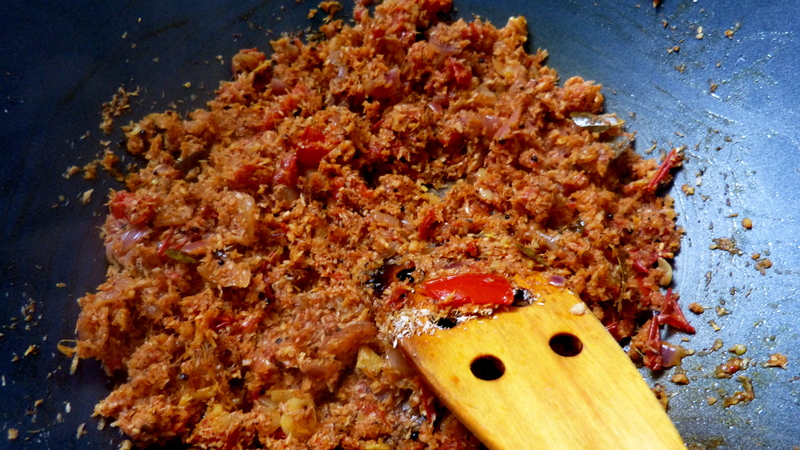 As such, I haven’t done the paste in a wet grinder, but added the spices & the grated coconut (roasted together) to the tomato-onion stir fry. Using more tomatoes ensured me with enough liquid for the time being. 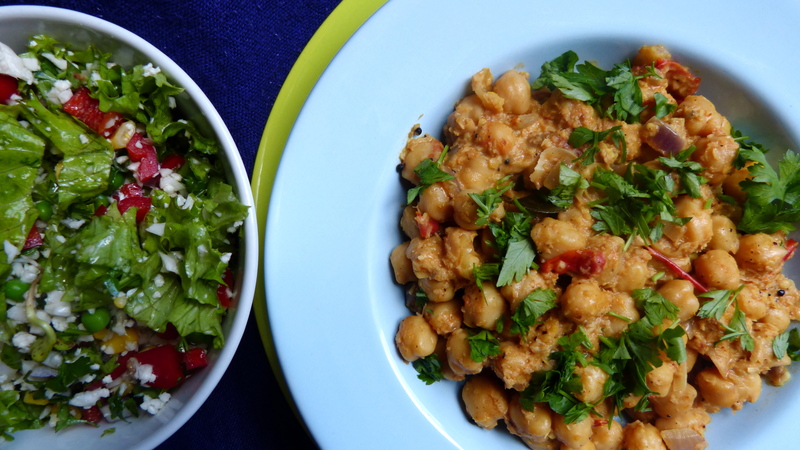 I then added the coconut milk along with the chickpeas and brought it to the boil once more. Warning: the result it’s dangerously delicious! Indian food…mmmm! I admit I have a crush. And it’s actually a crush on spices and enhanced flavors that I’m infatuated about. Although my eyes haven’t dropped on any reliable health claim on the methods of heating up the spices, my experience is that as long as it’s not oil & starch overloaded and of course, not in big quantities (which can be a bit tricky due to the typical thali ‘refill’ 🙂 traditional Indian food feels good in the body. 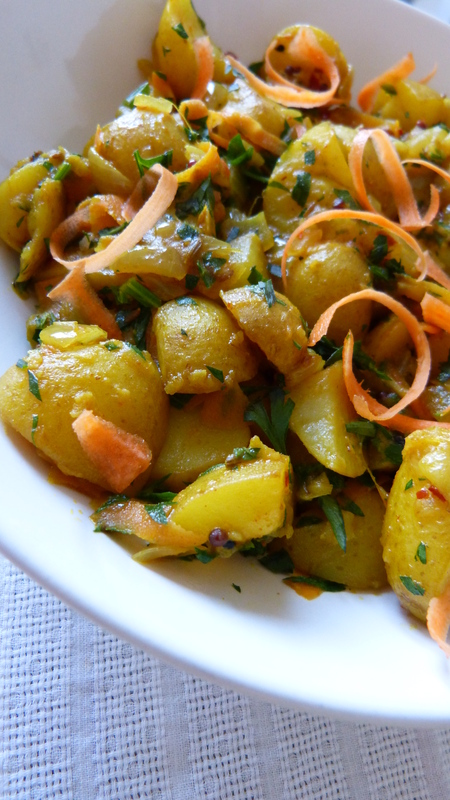 So let’s have a look at how spices can add up to such a common dish as potatoes. Once you develop the skills, you can start playing 🙂 Here I used a combination of black mustard, cumin, fennel & nigella seeds with chilly flakes, onions, ground turmeric and cumin. 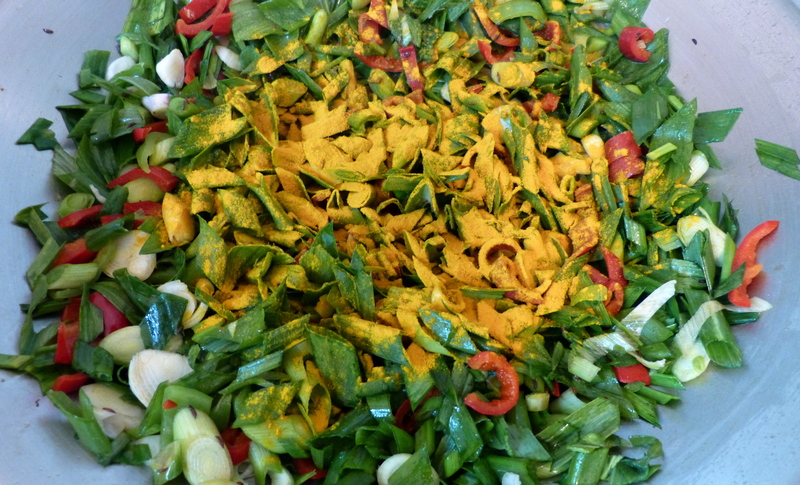 When the base was getting ready – the onions turning yellowish – I added the new potatoes, previously halved and boiled in salted turmeric water. Cook everything together for another 5 minutes, stirring constantly. Now bring some European touch to it 😛 chop some fresh coriander, spinach or spring onions and peel some carrot slices to balance the taste and make it look even better! Whenever I feel like having something warm, I go for a soup or a puree. The difference between them is only in the amount of liquid you’d add (plain water or the water in which the veggies have boiled). My favorite ingredients are red lentils, root vegetables – carrot, celeriac, parsnip, beets, etc – and pumpkin. And of course plenty of seasonings: ginger, garlic, cumin, turmeric, pepper, chilly, sumac, etc. 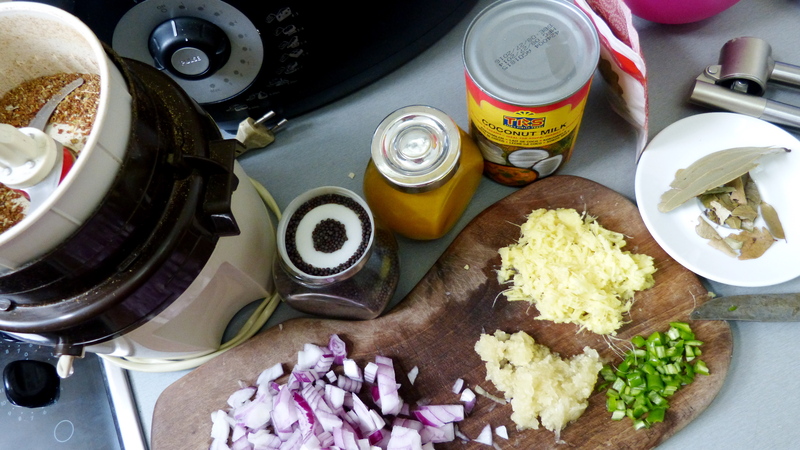 Even though I usually go straight to the same method of preparation as in raw food – mixing the ingredients all together – I learned that one of the main tricks of creating flavor when boiling vegetables is to add the seasonings while the process is going on. So, depending on what taste you want as dominant – sweet or spicy – bring the spices to the boil. If you have black or white cardamon seeds, cinnamon bark or bay leaves, these will definitely make the difference. 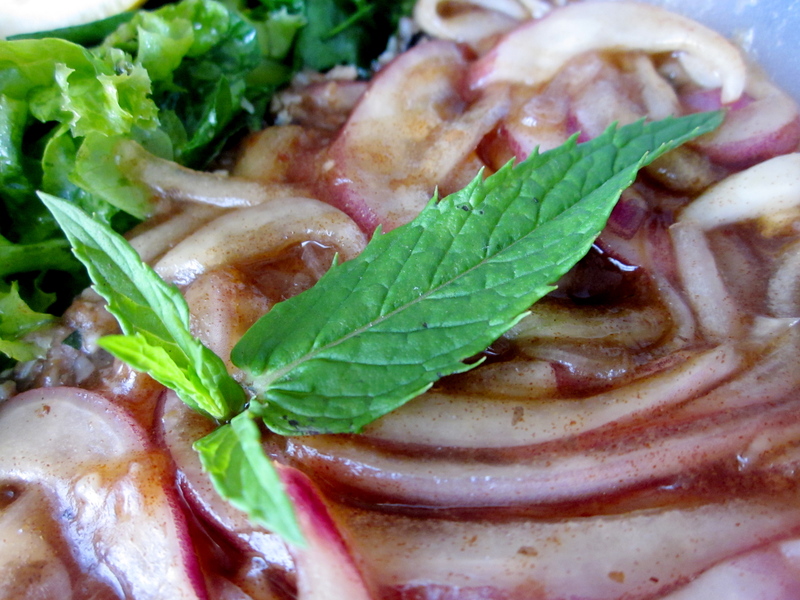 Also adding some onion or garlic at this point will considerably enrich your dish flavor. Once you start adding the composition to the mushrooms (if there’s not enough liquid, just add water) you’ll see how they turn tender and shrink. 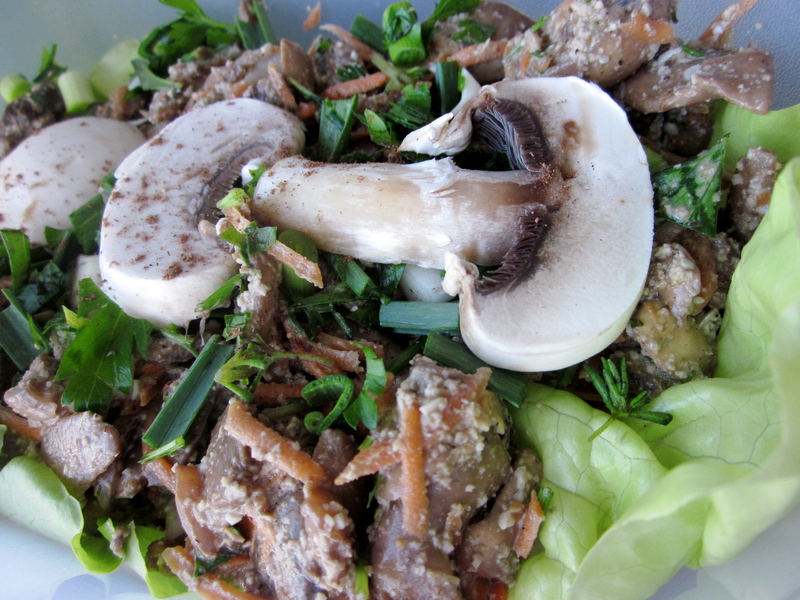 Leave the marinade overnight in cool place or in the fridge and then add it to your favorite salad. 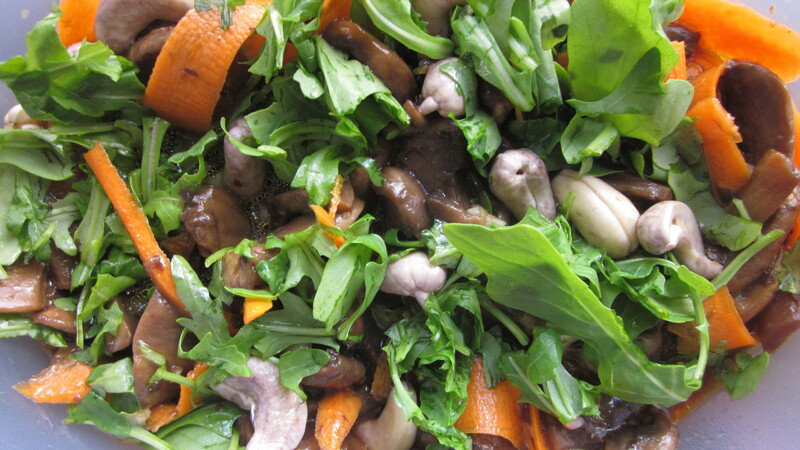 Like any other respectable protein, the mushrooms get along very well with carrots 🙂 Feel free to experiment any dish with these two, along with your favorite greens. Lots of greens. 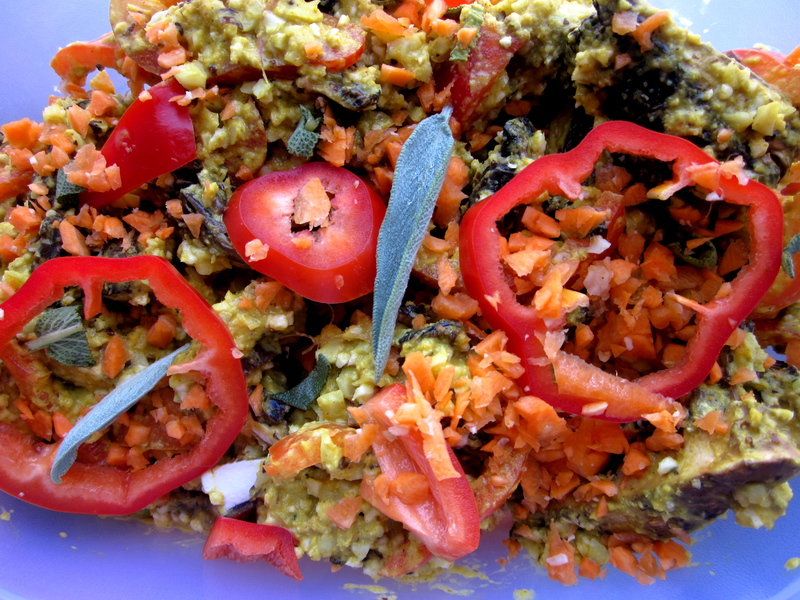 And this is how the pretty forest mushrooms in the above picture turned out: a dish with shredded cauliflower & carrot, red peppers, turmeric and salvia leaves. 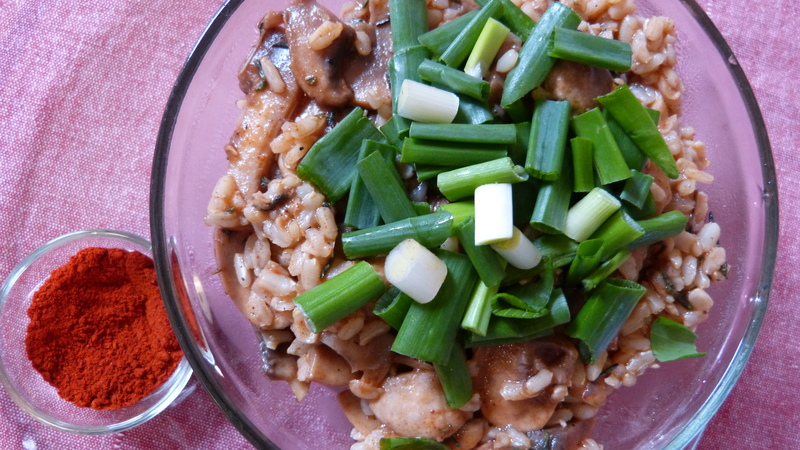 A sample of the smoked paprika marinade, mixed with whole grain brown rice and served with green onions. And another sample of a different marinade, made out of soya sauce, dates (crushed or paste) and only a bit of lemon. This is how red onions look like after spending some time in this thick liquid. if your mushrooms are picked up from the forest, be sure to check if they require to be cooked over heat. some of them might be poisonous when raw!